Artistic risks are a peril to anyone who paints, draws, writes, creates anything. Have you ever gotten the sketch for a painting just exactly right, looked at it and been afraid to put one stroke of oil pastel, paint or pastels on it because you're sure you'd screw it up? There it is -- finite perfection, the best sketch of that subject you ever did. There it isn't, the finished painting you see in your mind that gave you the idea to do this thing in the first place. OMG, I am going to ruin this. It doesn't matter how long you've been painting, this can come up for experts as often as for beginners. One thing that I tell myself when I get into that state of mind is that I'm not risking a lot. I'm risking a helpless piece of paper and a little bit of pigment. That's it. These are inanimate objects, toys, cool things I've got around my house that I could replace easily if I use them up, which one painting isn't likely to do. Even if it's expensive paper and the best artist grade oil pastels, I'm risking maybe the cost of eating out once in order to try this cool thing which may come out as an awesome painting. They don't mean anything until you use them. Artistic risks aren't physical risks. You're not going to break yur arm unless you're trying to oil pastel the ceiling of a church on a rickety scaffold or something. You're probably not even risking ridicule, considering that if it doesn't turn out you can just set it aside and start over, doing a better version of it. You don't have to show your failed paintings to anyone else if you don't want to. In fact, if you do in a good art forum like WetCanvas.com you are likely to get advice from serious professionals on how to fix it and maybe turn it into the spectacular vision you had in the first place. They can usually tell what you were going for and what you need to make it right. Here are some things you can do to face artistic risks, like the panic when you stare at a perfect sketch, dreading that you won't ever be able to get that perfect sketch back if you mess up the painting. First, copy that sketch. Yes. Just copy it by hand into your sketchbook. Take a scan for reference too if it's strong enough to show up in a scan. Trace it. But get it copied in a form that you'll have it next to you for reference. Tracing is very good because if you do mess it up on the first painting, you can pull out another defenseless piece of Uart or Colourfix and transfer it directly to start from the same starting point. 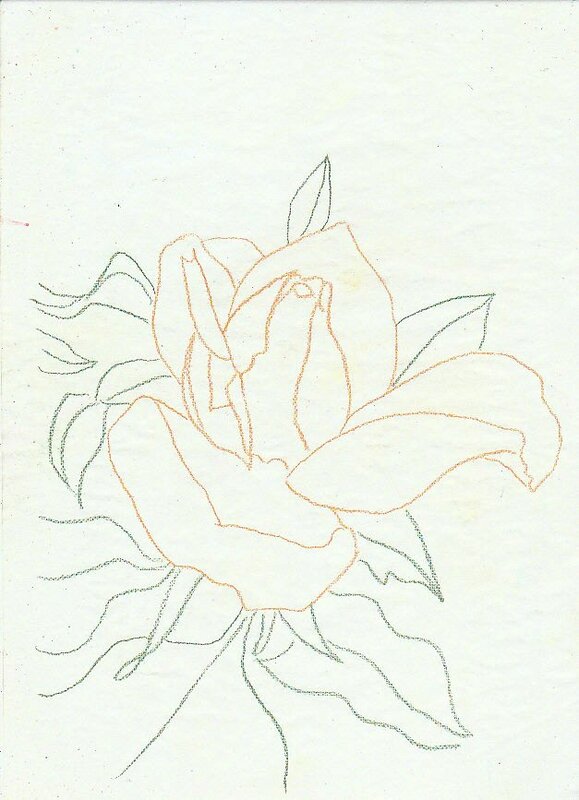 Now you can proceed with the original just fine, without worrying about whether doing the turpentine washes will flow over the hard edges of the petals and wreck it, or the brush will start scraping previous layers off and turn it into a botch, or whether it just looks bad when it's done. So that's one level of artistic risk knocked out at the start. Tracing your sketch saves that bit of personal progress and you will be able to keep trying and trying until you get that painting exactly the way you wanted it. 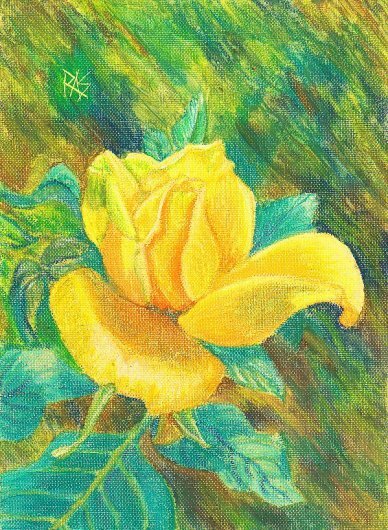 I might use the Yellow Rose sketch again for a series of roses in different colors. But now looking at the sketch, maybe you're not sure how the painting will look or if your idea will work. Do a preliminary version of the painting in your sketchbook with student grade supplies. I did this several times with major paintings and it came out well. Just doing a small preliminary version in a sketchbook helped me work out the color harmonies, change the composition and so on. Try doing a notan of it or a black and white value drawing of it. The more of these preliminary stages you put into a serious painting, the easier it is to relax about the artistic risk of creating the final painting. You can do color swatches for every area in it from your subject's skin tones to the color of one particular shadow. You can do texture studies to see if you want the leaves to look different from the petals and use a different technique. You can just systematically work up to the big painting by working out the specifics of every part of it till you have a good idea what the final version will be. You may even wind up adjusting the perfect sketch, moving it on your surface to balance the negative space better or making changes for other artistic reasons. That's all right. That's a lot of what goes into serious paintings by major well-known professionals. If you're like me, sometimes you skip those preliminary stages and rush on into the painting when the sketch is a good one or you're wild with the first flush of enthusiasm of the idea. That's a way to create panic about artistic risks because you haven't worked out all the technical questions about that painting. It's all right to do that sometimes because you may be working with familiar materials and a subject similar to what you've done before. I'm not saying those preliminaries are always necessary. What I'm saying is that when you do reach the freeze over an artistic risk, that's the time to remember all those preliminary stages are there to help you find out what scared you. It may be some specific problem or gap in your skills is lurking ahead that you intuitively noticed but can't identify yet. Maybe the composition's off or you aren't sure how to mix that color or get the details on an eye or a leaf. Testing just the troublesome bit on a scrap and trying it in different ways will solve the problem without ruining the painting. So when you get into that state, just relax, take a deep breath, copy your sketch carefully and move on to working out how you're going to handle the artistic risks of doing a major painting. It's a good habit to get into, and doing all this preliminary stuff filters out the fear, building confidence at every step so that you can create the painting you first saw in your mind. That painting is already there, just waiting for you to push past the scare and do it. Go for it!